� Delivers superior performance for communication and collaboration. � Ideal for high-profile, heavy-use offices and conference rooms. 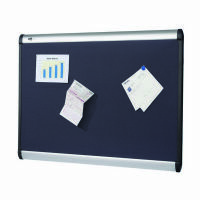 � Perfect for hanging documents without holes using Quartet magnets. � Sleek aluminium frame will be the focal point in any interior. � Self healing surface eliminates unsightly pin holes. � Will not crumble or fade after years of use. � Includes wall mounting kit.